조선시대에 돌로 쌓은 석성으로 임진왜란과 병자호란을 겪고 난 후인 숙종 29년(1703)에 국방을 튼튼히 하고 바다를 지킬 목적으로 쌓은 곳이다. 전체길이는 약 17km이다. 『증보문헌비고』에 의하면 박태항에게 책임지어 쌓게 한 것으로 기록되어 있으나, 이에 앞서 현종 8년(1667) 통제사 이지형이 왕에게 금정산성을 고칠 것을 건의하는 기록이 있는 것으로 보아 이미 오래 전에 쌓은 것으로 보인다. 낙동강 하구와 동래지방이 내려다 보이는 중요한 곳에 있어 바다로 침입하는 적에 대비한 성임을 알 수 있으며, 성의 크기나 성벽을 쌓은 양식으로 볼 때 처음 성을 쌓은 시기는 보다 앞선 시기까지도 올려 볼 수 있다. 숙종 33년(1707)에는 성이 너무 넓다 해서 성의 중간에 남북을 구분하는 성을 쌓았고 영조 50년(1774)에는 성이 너무 커서 지키기 어렵다 하여 일단 폐지하였다. 순조 6년(1806)에 성을 다시 고쳤으며, 성벽은 화강암을 자연석 그대로 이용하였다. 일제 강점기에 일본인들에 의해 파괴된 것을 1972년부터 1974년까지 동문·서문·남문을 복원하였으며, 1989년에 북문을 복원하였다. 현재 4㎞의 성벽이 남아 있으나, 조선 후기에 도성과 주변의 대규모 방어시설을 충실히 하는 과정에서 만들어진 우리나라 최대 규모의 산성으로 중요한 의의를 지니고 있다. This is a fortress built of stone with a total length of 17,337m for the purpose of territorial and coastal defense in 1703, the 29th year of the reign of King Sukjong, a time of growing consciousness of the importance of national defense following the experience the Japanese invasion of Korea in 1592 and the Manchu Invasion in 1636. 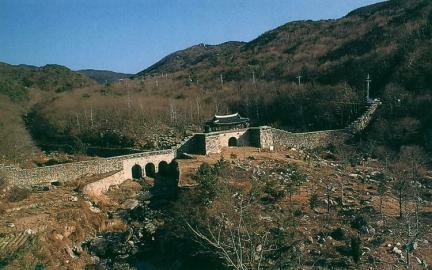 There are two different but related records with regard to the period of its construction in one chronicle called Jeungbo munheonbigo (The Revised and Enlarged Edition of the Comparative Review of Records and Documents): one, a note of the building by order of Park Tae-hang and the other, regarded as earlier than that of Park, of a recommendation (for the reconstruction of this fortress) by Yi Ji-hyeong, a commander-in-chief of the naval forces, to King Hyeonjong in the 8th year of his reign. 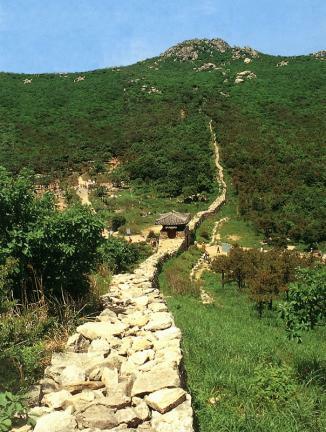 The real period of the construction to this fortress, therefore, might fall on the side of Yi Ji-hyeong. 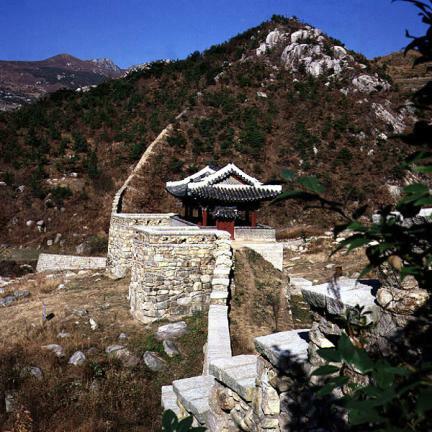 The fortress is located at an advantageous position for observation of the lower region of the Nakdonggang River and of Dongrae district (now a part of Busan), and especially for watching watching out for attacks by foreign countries like Japan through the marine passage. The scale of this fortress and the mode of constructi its walls have some experts infer a later period for the beginning of its construction than hypothesized on the basis of the records from the historical material above. 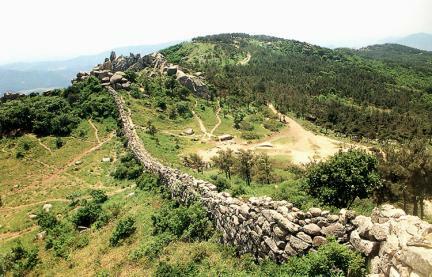 In the 33rd year of King Sukjong ‘s reign (1707), the inner wall dividing the north and south sections was erected due to dominant opinions that the area of fortress was too large to be effectively managed. 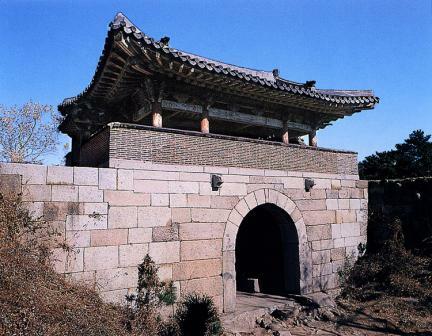 It was for instance closed for the same reason explained above in the 50th year of King Yeongjo’s reign (1774). 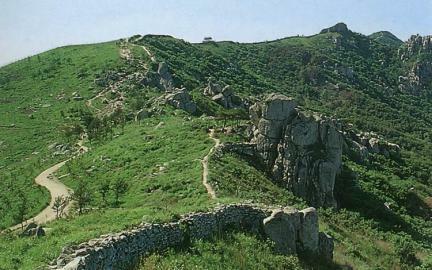 In the 6th year of the reign of King Sunjo (1806), the fortress was partly rebuilt and reinforced with natural granite, but it was largely demolished in the period of Japanese colonization. Repair work started in 1972, completing the restoration of the old regime of gates in the east, west and south in 1974, and in the north in 1989. The walls still remaining reach a length of 4km. 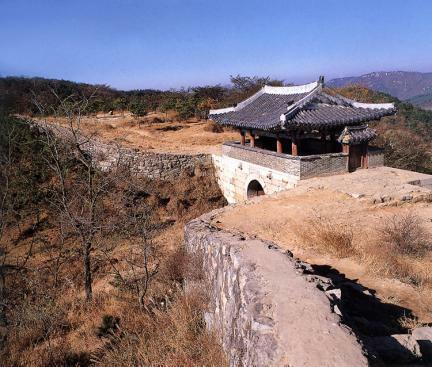 The historic significance of the place lies in the fact that its ruins tell us about the structure of large-scale defense positions around the fortress in the late Joseon Dynasty and that it shows us the form of the largest fortress in Korea.